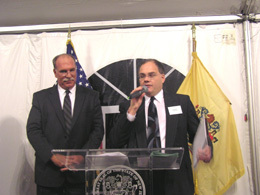 New Jersey Department of Environmental Protection (DEP) Commissioner Mark Mauriello honored environmental leaders at a ceremony December 4, 2008 announcing this year’s Environmental Excellence Awards winners. 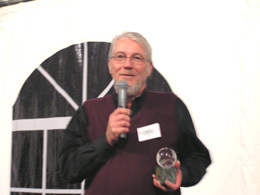 Winners were judged on the basis of documented environmental benefits, innovation, and long-term impacts of their work in the environmental field. 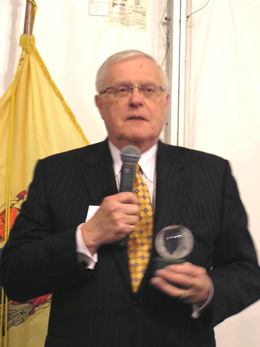 The award categories included achievements in Environmental Education, Clean Air, Water Resources, Safe and Healthy Communities, Land Conservation, Healthy Ecosystems, Innovative Technology, and the CleanWater New Jersey Category Awards. Opened in 2004, Aspen Ice is a state of the art sports complex located in Randolph, NJ featuring two Olympic size ice skating rinks. The Aspen Ice facility was conceived and built using sustainable design and energy efficient principals. In 2007, the largest standing seam solar electric system east of the Mississippi was installed at the facility providing approximately 60% of the power used at Aspen Ice. Other features include high efficiency chillers, reflective insulation, high efficiency lighting systems, high efficiency motion sensors and gray water collection and reclamation. In total, the efforts established at Aspen Ice result in a savings of approximately 500 metric tons of greenhouse gas emissions per year. The Bonner Community Scholars Corps (Bonner Scholars) is comprised of 65 student leaders on the campus of The College of New Jersey (TCNJ). Started in 2004 under the leadership of TCNJ President Dr. R. Barbara Gitenstein, the College references this program as their “domestic peace corps.” Each Bonner Scholar spends a minimum of 300 hours per academic year working collaboratively with community partners in thirteen issue-based areas, including the environment, to improve the quality of life in Trenton and the surrounding vicinity. In the 2007-2008 academic year, environmentally-focused Bonner Scholars mobilized 260 The College of New Jersey first-year students to complete their Community Engaged Learning graduation requirement on an environmental project to remove litter along the Trenton portion of Delaware and Raritan Canal State Park. Through the Bonner Scholars’ efforts, over 4,000 hours of community service was dedicated to the Trenton stretch of the park. 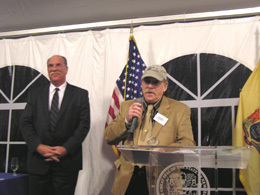 Brothers George and Tyler Cicero’s love for Lake Hopatcong spurred them to create the “Lake Hopatcong Times” publication and an accompanying website, www.lkhtimes.com, dedicated Lake Hopatcong and raising funds for its protection. Begun in 2007, the Lake Hopatcong Times is a combination of news about Lake Hopatcong as well as other environmental and volunteers topics such as protecting the Highlands, conservation efforts at Lake Musconetcong and Habitat for the Humanity. 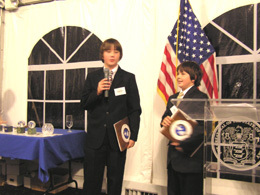 The boys are recognized for their publication and innovative approach to teaching others about protecting our environment. Since 1969, Ella Filippone has been committed to improving the overall land and water resource of the Passaic River Watershed through education, research and public service. 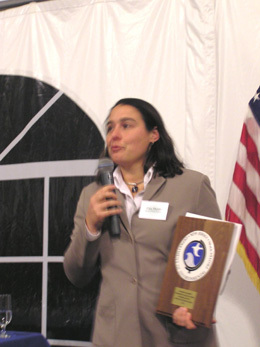 Among her accomplishment, she spearheaded the defeat of the ill-planned flood tunnel proposed by the Army Corps of Engineers and initiated the Blue Acres Program of 1995 and again in 2007 to buy residences in flood zones instead. Moreover, she worked with the state government to find $10,000,000 from an old appropriation to be used for interstate efforts that became part of the price of Sterling Forest. 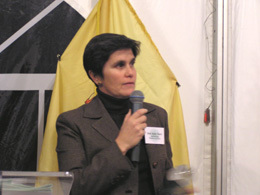 She led the NJ delegation to Washington, DC that convinced Speaker Newt Gingrich to find additional money to save Sterling Forest. She advocates that “Improving water quality is not just our goal; it’s your future!” Her work with Dr. Anne Kruger and the Ground Water Protection Committee has led to model ordinances for Well Head Protection and Riparian buffers. Through a variety of programs and projects, including a land trust of 1,000 acres, her leadership continues to influence local, state and national decision making. 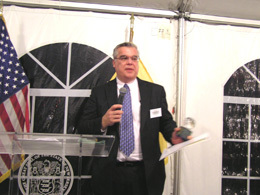 Ellla is recognized as a dynamic part of NJ’s environmental community. Founded in 1992, the Musconetcong Watershed Association is dedicated to protecting and improving the quality of the Musconetcong River Watershed. Among the association’s many accomplishments are achieving designation of the Musconetcong River as a Wild and Scenic River System and creation of the first river trail map in the state. Other initiatives include an active and highly successful dam removal program, creation of a popular volunteer water monitoring program, and watershed education programs for schools and the general public. The Barnegat Bay Shellfish Restoration Program serves to educate the citizens of Ocean County and NJ about the coastal bay, its watersheds and peoples’ impact on these natural resources by using the hard clam and oyster as living representatives of the bay ecosystem. The program educates people about the requirements needed by these shellfish that serve as watchdogs for good water quality, and how they can be stewards of the natural resources that we share. In its first three years, the program has successfully raised through the nursery stage about 3 million clam seed and 500,000 oyster seed. The clams have been planted in Barnegat Bay in three locations, and the oysters have been placed on a reef in the Mullica River. The current oyster crop will be planted on restored antique oyster reefs in the Mantoloking and Toms River areas. This will help improve the bay for oysters and other estuarine species. The goal of the shellfish growth and planting phase is an increase in natural spawning, habitat availability, and filtration capacity of these natural areas. Over the past four years, over 100 volunteers have been trained through their curriculum program to raise these shellfish for restoration back into the bay. Volunteers learn, then teach the public about the bay, and encourage citizens to take action in its restoration and improvement. As the program continues to grow, the impact of this community education and stewardship initiative is helping citizens to both re-clam the bay and to reclaim the bay, by becoming better stewards and environmental citizens. The Rutgers EcoComplex is New Jersey’s first environmental research & outreach center, and the first center of its kinds in the nation, serving as a university-based resource hub for the state’s environmental and renewable energy industries. The center focuses on commercialization of new technologies that address pressing environmental and energy issues facing New Jersey and the nation. The pooling of resources and expertise leads to faster, smarter, sound solutions to environmental problems. 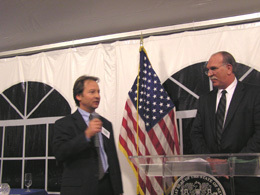 The EcoComplex demonstrated innovative, sustainable technologies resulting in environmental and energy benefits, reductions in greenhouse gases and conservation of natural resources, while also creating “green collar” jobs for New Jersey. These methods are easily transferable for use by other states and countries. The EcoComplex earned worldwide recognition for its work and many other states and countries have visited the EcoComplex to gain a better understanding of the technologies. This year 12,000 visitors are expected by year’s end. Joint Base McGuire-Dix-Lakehurst (JB-MDL) sits in a location where land conservation and environmental stewardship are critical. The actions taken at JB-MDL in 2008 reflect the U.S. Department of Defense’s and local attention to the need for collaborative planning, compatible development, and land conservation. As a result, in the last two years, more land has been preserved by the installation than in the previous fifty years. JB-MDL provides a model arrangement showing how the military in cooperation with the local community can benefit land conservation and environmental stewardship initiatives. Similar actions are now being conducted across the United States to preserve land, protect resources, and manage growth while sustaining the military mission. The attention, dialogue and partnering associated with these efforts will enable the win-win planning needed both now and in the future. Cherry Hill Township, a municipality that encompasses 24.4 square miles of Camden County and has a population of approximately 75,000 residents, is recognized for their environmental sustainability programs. These practices include the installation of LED bulbs in traffic signals, preserving open space and, in keeping with the state’s commitment for reducing our climate change impacts, for implementation of a Green Action Plan designed to reduce the municipality’s carbon foot print. One highlight of the Green Action Plan is the creation of a nonprofit organization – called Sustainable Cherry Hill – which is comprised of hundreds of Cherry Hill residents that provide grassroots environmental leadership in the community. Another highlight is the installation of solar panels on the Cherry Hill City Hall. This project, when completed, will allow the township to save up to 20% of its electrical usage. 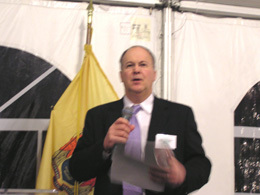 Captain Bill Sheehan, Hackensack River Keeper Inc. Founded in 1997, Hackensack Riverkeeper is a community-based environmental organization dedicated to preserving, protecting and restoring the Hackensack River and its 210-square mile watershed. The organization carries out its mission and that of representing the region’s living resources through public education and outreach, open space preservation, clean water advocacy and enforcement of environmental laws. Initially a volunteer venture, the Hackensack Riverkeeper is now supported by five full-time employees, an AmeriCorps Watershed Ambassador and more than 300 active volunteers. 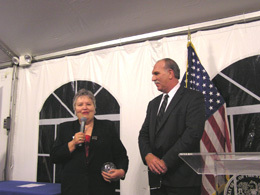 The organization also benefits from a donor base of more than 2,000 individuals, groups, foundations and corporations. Hackensack Riverkeeper is recognized for their efforts to educate and promote protection of Category One waterways, among other things. Category One waters are waters designated for protection because of their exceptional their water quality, aesthetic value, and ecological integrity. Ocean Township received their award for their demonstrated excellence in implementing the requirements of their Tier A Municipal Stormwater General Permit. Among their many accomplishments, the township has completed the labeling of over 3,500 storm drain inlets, two years ahead of the scheduled implementation date in their permit, utilizing volunteers from local Girl Scout troops and students from nearby Monmouth University to complete this project. The township also created a fun and information public service announcement regarding collection and storage of leaves. The goal of the PSA was to point out what can happen when residents are not compliant with municipal regulations as well as the effects that their actions can have on animal life, water ways, and aquatic habitats. Ocean Township also created a computerized map of the municipality’s entire stormwater system. Point Pleasant Borough is a community that is nearly surrounded by water which is enjoyed by residents, visitors, and wildlife. For many years, residents in the municipality would request the borough offices do something to reduce the amount of floatable materials which continued to accumulate in local water bodies. In response to community inquiries and State regulations, the Public Works Department began the process of voluntarily retrofitting over 100 inlets that drain to Barnegat Bay which would not have required a retrofit under the specifications of the municipality’s Tier A Municipal Stormwater General Permit. This initiative has encouraged neighboring municipalities to follow suit and voluntarily retrofit some of their storm drain inlets, with the goal of providing pristine waterways. Point Pleasant Borough projects to have the entirety of the municipality’s storm drain inlets retrofitted within seven to ten years. 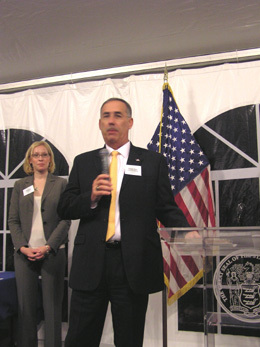 Kean University has been proactive in the implementation of its Public Complex Stormwater General Permit. The University expedited the mapping of stormwater outfalls and labeling of storm drain inlets, completing both requirements well ahead of schedule. The university recognized that it was not only the public portions of the campus that needed to become more stormwater friendly; the maintenance yard required changes as well. Kean has implemented quarterly vehicle maintenance area inspections and monthly inspections of the yard’s fueling areas which are not required to be implemented by their permit. 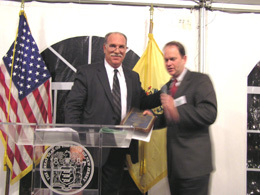 Ocean County was recognized for a number of initiatives including installation of two vehicle wash systems at separate facilities well before the February 28, 2009 deadline for permittees to cease the unpermitted discharge of equipment and vehicle wash wastewater. The county is anticipating offering shared services to other local permitted entities at the Toms River vehicle wash facility. 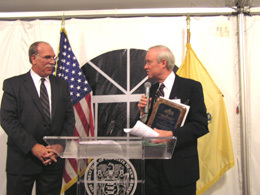 In addition, between April 2007 and March 2008, Ocean County retrofitted 1,557 storm drain inlets which were not specified as being required for retrofit under their permit’s minimum standard. Moreover, storm drain inlet treatment devices were installed to remove sediments and floatables in areas with high vehicle and pedestrian traffic. Additional treatment devices were installed in portions of the county’s stormwater collection system which discharge to C1 waterways and tributaries. Note: The preceding project and winner descriptions are based on information provided by the applicants and/or third party nominators.